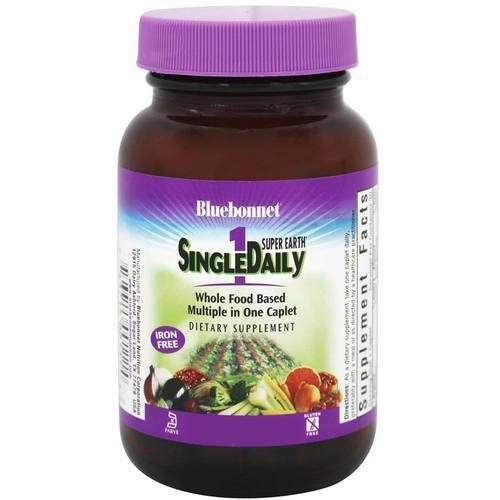 Bluebonnet Nutrition Iron Free Super Earth Single Daily MultiNutrient Formula features a whole food bases multiple formula. Advertências: Keep out of reach of children. Do not consume more than recommended dosage. Consult healthcare provider before starting this or any other dietary supplement. Notas: Gluten Free. Kosher. Free of egg, fish, crustacean shellfish, tree nuts, peanuts, wheat, yeast, gluten, barley, rice and sugar. Recomendações de uso: As a dietary supplement, take one caplet daily, preferably with a meal or as directed by a healthcare practitioner.